World's Largest Cedar, originally uploaded by Jesse The Traveler. "In 1938 the Federal Government in Washington DC agreed, after a long bettering from conservationists, to carve out a national park 3000 miles away on the west side of the Olympic Peninsula in Washington State. This saved from the loggers four rain-swept river valleys, rich in old growth forests - the Bogachiel, the Hoh, the Queets, and the Quninalt. But, as so often happened in the Pacific north-west, on both sides of the Canadian-US border, the boundaries of the new park were deliberately designed to exclude much of the best old-growth forests. The Nolan Creek cedar grew in the heart of an ancient forest west of the park. less than 30 years ago, loggers were licensed by the state to clear-fell the whole area. 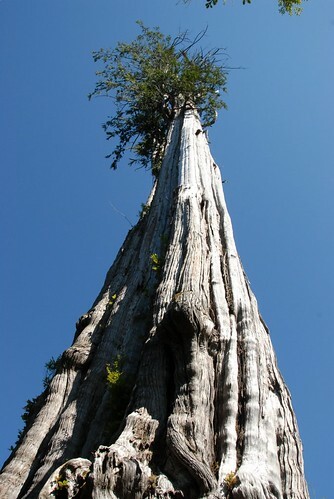 When the chainsaw reached this western read cedar (Thuja plicata) and people realized that it was the third largest red cedar in the world (it's 178 feet tall with a volume of 15,300 cubic feet) even the loggers' spirits failed. Generously they agreed to preserve this single tree - worth, they say, the huge sum of $25,000. And there is stands today. If the loggers hoped the tree would show their hearts were in the right place, they knew little about trees. Of course the giant could not survive the fierce winds of the clearcut. First the mosses and lichens, then the tree itself, began to die. Now it is a bleached skeleton with few living branches. There is a message there, I am sure, that the public can not miss. How futile is it to make this mean sort of compromise, rather than saving the whole watershed . . . Imagine trying to preserve this king of the forest, when all his kingdom lies in ruin. Soon his bones, too, will lie at Nolan Creek." "Remarkable Trees of the World"